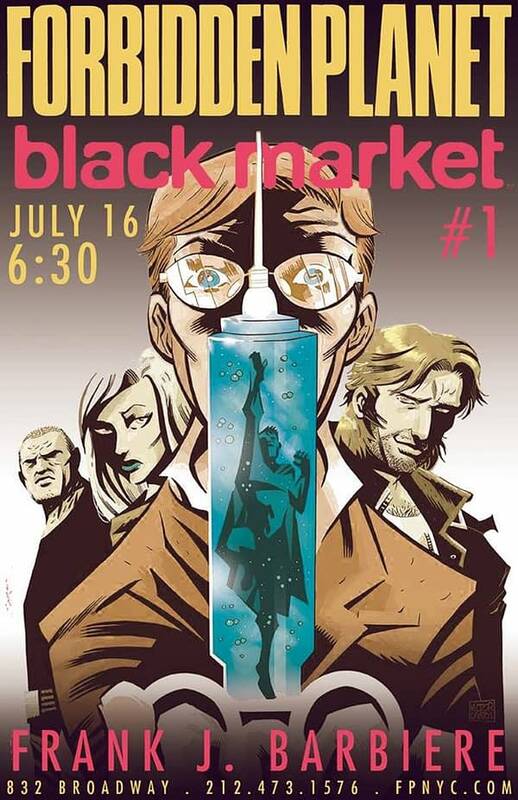 Forbidden Planet at 832 Broadway in New York will host writer Frank Barbiere (Five Ghosts, Solar, Blackout, New Avengers Annual) at a signing for the launch of his new comic with Victor Santos from Boom!, Black Market from 6:30 to 8:30PM. Midtown Comics Downtown will host John Romita, Jr. in a signing of Superman #32 from 6-8PM to celebrate his work for DC Comics, and a number of incentive covers will be available for signing on that say. Locust Moon Comics at 34 South 40th Street in Philadelphia will host a mega-signing in “An Evening with Paul Pope, Dean Haspiel, and Tom Scioli” at 7PM. They say: “Beat back the dog days of summer with one of the finest nights the Philly comics scene will see. Join us for an intimate celebration of these three cartoonists and their new books:Paul Pope’s ESCAPO, Tom Scioli’s TRANSFORMERS VS GI JOE, and Dean Haspiel’s FEAR MY DEAR. It’s going to be a night to remember, folks. Be there”. All three Midtown Comics locations in New York City will be celebrating Batman Day, the 75th Anniversary of Batman, on July 23rd. They say: “Help Midtown Comics Celebrate The 75th Anniversary of the Dark Knight! Batman Day is Wednesday, July 23, and Midtown Comics is excited to celebrate this monumental event! Batman fans of all ages can come to any of our locations and find Batman comics, toys, merchandise, apparel, and more! Best of all, we’ll have a number of free Batman goodies from DC for you to enjoy! Holy Smokes, Batman! Find more info here. FREE · DETECTIVE COMICS #27 Special Edition, featuring a reimagining of the 1939 Bob Kane/Bill Finger original comic book, designed by Chip Kidd with a script by The New York Times #1 bestselling author Brad Meltzer. Quantities are limited! FREE · Batman shopping bag 12” x 16” x 4” featuring Batman 75th Anniversary artwork on one side and the Batman 75 logo on the reverse side! 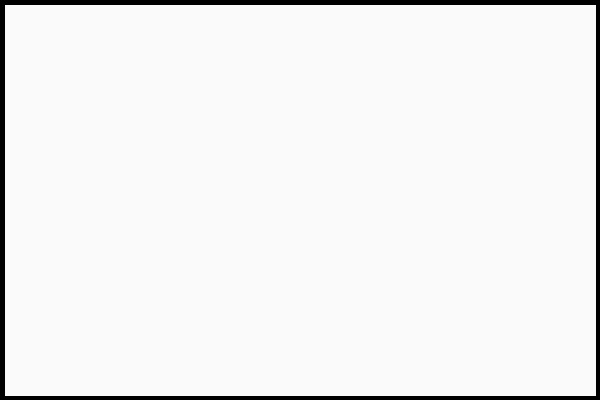 FREE · Batman Graphic Novels bookmarks! Only $.99 Cents each at Midtown · Batman paper masks spotlighting 4 varieties of the character’s iconic looks from his 75-year history. Collect all four! You know that we’ll be wearing them around! Only $9.99 each at Midtown · Batman 75th Anniversary Capes produced by Rubies. Customers can purchase these limited edition Batman 75th Anniversary capes”. Dean Haspiel’s Spectacular Disaster will be held on Wednesday, July 23rd at 7:30PM at Union Hall, Brooklyn. They say: “Join your host Dean Haspiel for a psychotronic salon featuring comix slideshows, spoken word, comedy, music, and a chance to win the Open Mic spotlight. Come and take your shirt off! 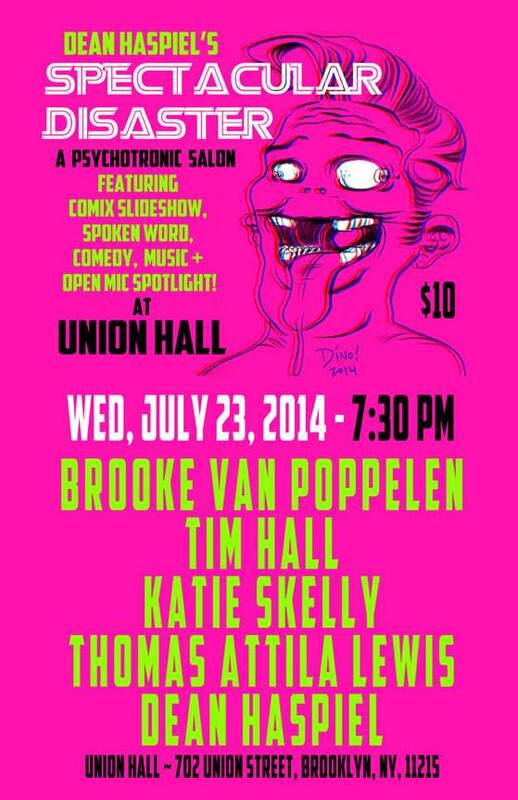 Featuring: Dean Haspiel, Brooke Van Poppelen, Tim Hall, Thomas Attila Lewis and Katie Skelly. Plus, the Open Mic Spotlight: Think we’re special? Nuh-uh. You can do it, too! Drop your name in the hat and be entered to win our coveted shine a light/open mic slot”. The Little Nemo Kickstarter Closing Party will be held at Locust Moon Comics at 34 South 40th Street in Philadelphia at 7PM. They say: “Locust Moon Comics swells with gratitude and joy over the success of our LITTLE NEMO: DREAM ANOTHER DREAM Kickstarter — come help us celebrate and make the final push towards our amazing stretch goal with a reception and who-knows-maybe-a-dance-party at the shop”. Dare2 Draw will be hosting another of their live drawing/competition events at the Society of Illustrators at 128 East 63rd Street in New York, with special guest Mentor Russ Braun from 6-9:30PM. 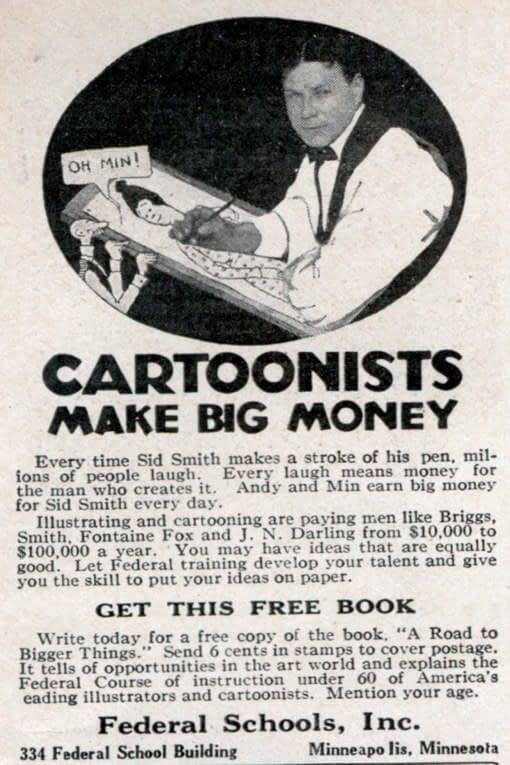 They say: “Come Dare2Draw with Mentoring Guest Artist Russ Braun! Russ will be talking to us about his career in comics and the changes he’s seen. He’ll also be sharing some secrets he’s picked up along the way, throughout his career. Bring your sketchbooks for an evening of live drawing with Dynamic Action Models. Contests & Give-aways, Demonstrations, Q&A and mingling with other cartoonists, our signature “Quick Draw” Contest and “The Re-Load”, four ridiculously awesome “Quick Draw” prizes, all with Copic, Pentel and Sakura Art Supplies, action figures, TPB, more… FREE comics from Jay and Silent Bob’s Secret Stash! Featuring 90 minutes of dynamic figure drawing, with live-action models & props and our signature Dare2Draw “Quick Draw” Contests, with all art done on Blue Line Pro boards. The pro art is auctioned for artists-in-need”. 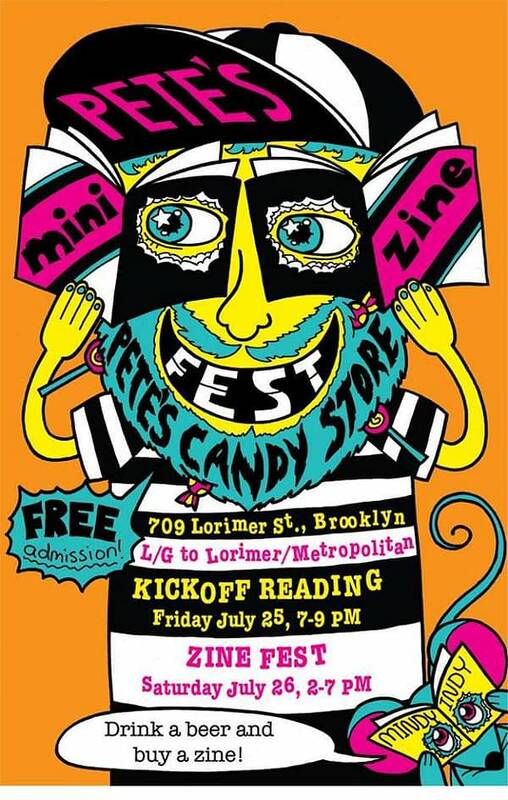 Pete’s Mini Zine Fest will start with a “kick off reading” on Saturday (from 7-9PM) and the Zine Fest will be held Sunday (from 2-7PM) at Pete’s Candy Store at 709 Lorimer Street in Brooklyn, New York and both are Free Events. And featuring. amazing delicious snacks by Pamela Bowman! Like our poster this year? Mindy Indy (who is also tabling) designed it! Midtown Comics Downtown in New York will host its “Not at Comic Con Party” on Saturday from 11AM to 9PM. They say: “We know not everyone can make it to San Diego Comic Con this year, so we’re throwing a special party for all those who will still be in New York! Our annual Not at Comic Con event returns this year on Saturday, July 26th at Midtown Comics Downtown, and we already have some fun details to announce. • Not at Comic Con Sale– 30% off everything at Midtown Comics Downtown only from 11:00AM to 12noon.  • 20% off everything at Midtown Comics Downtown from 12noon to 9:00PM. • Paul Kupperberg signing Life with Archie #36 from 2:00PM—3:00PM. • Batman Day items will be available! We’ll also probably have NY Comic Con tickets to raffle off, as well as tickets to The Avengers Station at Discovery Center”. 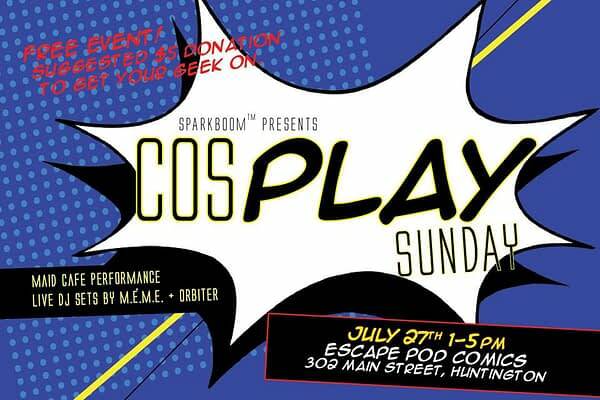 Escape Pod Comics at 302 Main Street in Huntington, Long Island, New York and Sparkboom will present Cosplay Sunday from 1-5PM. This is a free event with a suggested $5.00 donation.